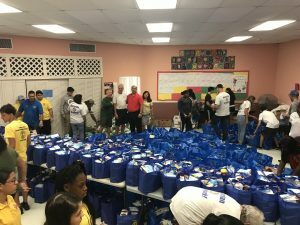 (Nov 17, 2018) – The Members of the Rotary Club along with Members of the InterAct Clubs from Robert Morgan High School & Cutler Bay Academy packaged and distributed Thanksgiving Week Food for 130 families in need in West Perrine. The Rotary Club has been providing the Thanksgiving Week Food Distribution for over fifteen years. The food provided includes a Turkey and all of the food for a Thanksgiving Meal and additional food for a week for these families. “Our Club Members enjoy providing the food to those in need every year! 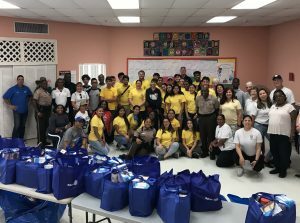 And teaming up for this annual event with the members of the local InterAct Clubs that we sponsor is a bonus,” stated Todd Lary, President of The Rotary Club of Perrine-Cutler Ridge / Palmetto Bay! Tayloe Perry, Past-President of the Club and Chair of the Rotary Club Thanksgiving Food Week Distribution, stared “Providing for those in need in our community is what we do! Our Club Members look forward to this day every year! The Rotary Club of Perrine-Cutler Ridge / Palmetto Bay is one of 32,000 Rotary Clubs in the world. The club provides service to their local community and humanitarian efforts around the world. Visit www.PCRPBRotary.com. Rotary International is the largest and oldest service in the world with 1.2 million members. Among many of its projects, Rotary International has led the efforts to eradicate Polio from the world – inoculating over 3 billion children! Visit www.Rotary.org.